As we approach 11 November 2018, Remembrance Day, the centenary of the 1918 Armistice, this is the very last of our Centenary Watch columns. Centenary Watch has kept an eye on the commemoration industry since February 2014. From one of our earliest Centenary Watch columns. 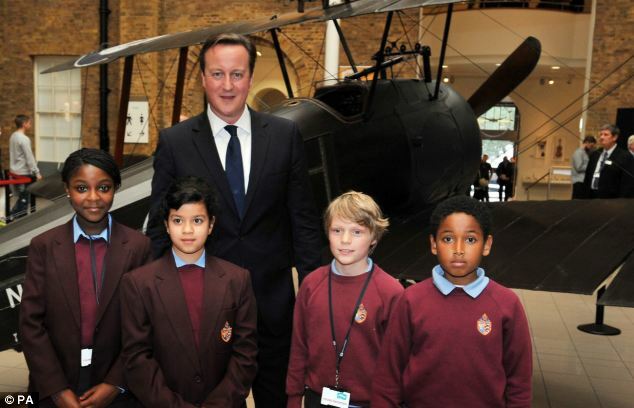 Then British PM David Cameron with schoolchildren. Politicians with kids has been a standard motif in commemoration in Australia also. Centenary Watch has even broken a couple of stories that the mainstream media had missed, such as the expiry date of the second term of the Director of the Australian War Memorial, Brendan Nelson (Update 30 January 2018). It has helped popularise the term ‘Anzackery’ to apply to the jingoistic, oversentimental version of the Anzac legend. As well as reporting, the column has tried to critique aspects of commemoration that have often been exempt from such treatment. Anzac may have taken on the status of a secular religion for some Australians but it is not (yet) the state religion; it is not compulsory to worship at its altars. Nor should sections of the commemoration industry, particularly those funded by public money, be immune from normal standards of accountability. On the other hand, we have offered praise where it is due, as has been the case with some innovative exhibitions at the War Memorial (relating to the Holocaust and to Indigenous service) and the ability of successive Ministers Assisting the Prime Minister for the Centenary of Anzac to be relatively less bloodthirsty and jingoistic than their predecessor. We would have liked to pay more attention to commemoration in the states and territories, which has been responsible for a good proportion of the approximately $A600 million spent on the Anzac centenary, but we have had to cut our cloth. The same goes for Great War centenary commemoration overseas, though we have heard enough from these countries, particularly New Zealand, to know that they are puzzled by the extent and cost of Great War nostalgia in Australia. Darren Chester MP survived the recent ministerial upheavals in Canberra and continues to put his name to routine announcements of initiatives in the Veterans’ Affairs portfolio, without notable outbursts of Anzackery. Pensions, veterans’ employment, mental health, funding of ex-service organisations, and some material for schools have been among the subjects of recent pressers. There were some new military grave headstones in Tasmania. It has always been a question in relation to successive ministerial changes whether there will still be a ‘Minister Assisting the Prime Minister for the Centenary of ANZAC’ (the all capitals form is the government’s preference). Minister Chester is still it, however, and will perform in that role in Armistice centenary events. On 19 September, Australian War Memorial Director Nelson made a speech to the National Press Club (as he has done frequently in the past). It was called ‘We’re all Australians now: 1918 and the war that changed us’ and had somewhat more recognition of the state of Australia after World War I – rather than stories of how we fought and died – than have most of Dr Nelson’s previous speeches. The NPC speech still included lots of heart-wrenching stories from the battlefield, some standard Nelsonian zingers (‘Every nation has its story. This is our story’, ‘the truths by which we live’), and the quota of quotes from Charles Bean, but nothing at all on the September 1918 mutinies, which Bean also wrote about. Greg Raffin’s new book, Mutiny on the Western Front: 1918, is timely. Dr Nelson’s speech is available on ABC Iview for a limited time. He also spoke to the Victorian Branch of the Australian Institute for International Affairs but that speech has not yet appeared online. We’ll look out for it. This week also saw the launching (apt term) of Ian McPhedran’s book, The Mighty Krait. Meanwhile, back at the War Memorial shop, there is for sale a line of memorabilia made from bits of the Krait discarded during the restoration. There are stilettoes for $299.99, nails for $79.99 each (or $29.99 without the wooden stand), two-up sets made from Krait timber for $99.99, Krait timber photo frames for $129.99, Krait timber pens for $79.99, Krait timber pen and desk sets for $119.00. An ABC article last year on the restoration suggested that Krait relics would appear in ‘museum displays’. This may well be true but there have been suggestions also that proceeds from the sale of relics will go towards the costs of restoration. We have tried unsuccessfully to confirm this with people who should know – and to find out what proportion of the proceeds goes to this cause. Perhaps this post will provoke a clarification. Regardless of the answer to that question, there will be some people who find the sale of Krait relics distasteful, just as there will be others who snap these knick-knacks up, even at those prices. After all, just like Channel 9 cricket memorabilia, they are in limited editions and come with a certificate of authenticity. 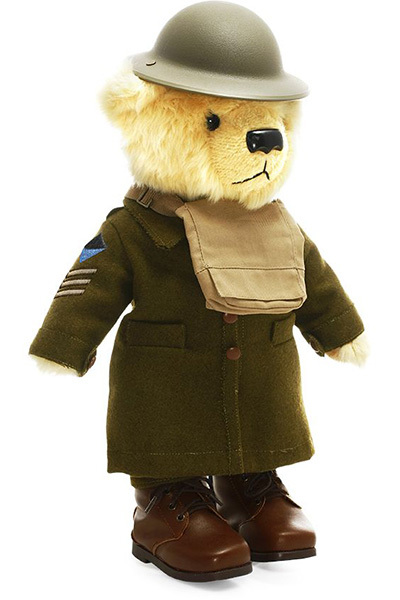 Bears to School is a program run by the Military Shop, a subsidiary of BrandNet, to put Anzac Bears in schools. (BrandNet has a website called ‘Australia in the Great War, 1914-1918’ which links to its other lines in military supplies and memorabilia. See note below.) At the time of writing, 704 bears had been donated to 460 primary schools by 371 sponsors, predominantly individuals and families, schools, RSL sub-branches and clubs, businesses, and service organisations like Lions Clubs. As with the Krait relics, opinions will differ across the community about this program. We know a little more, however, about where the money from the Anzac Bears goes than we know at present about the Krait knick-knacks. The bears cost $99 each and the organisers advise that $25 from each $99 is being distributed to the RSL and the National Servicemen’s Association. Ambassadors for the program include Keith Payne VC, Malcolm Turnbull, Bill Shorten, General Angus Campbell, War Memorial Council Chair, Kerry Stokes, broadcaster Alan Jones, and state and territory politicians. Ambassadors’ statements of support are on the Anzac Bears website. There will also be an exhibition on Australia after its wars – all of them, not just World War I. The exhibition will be temporary (a year from 5 October); it should be permanent. What war has done to Australia and Australians should be a subject for continuing reflection; if the Memorial’s ambitious extension plans come off, much of the new floor space could be devoted to telling these stories. Better that than housing superannuated helicopters.